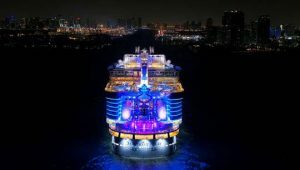 Royal Caribbean International’s Symphony of the Seas has made her highly anticipated debut to the cruise capital of the world, Miami. Fresh from her inaugural Europe season, the world’s largest and most adventure-packed ship sailed into her permanent, year-round home at Royal Caribbean’s brand new, state-of-the-art Terminal A at PortMiami, the largest cruise terminal in the U.S.
“Symphony takes family holidaying to an all new level with energy and options never before found in one place. This ship is the perfect blend of our greatest hits we know guests love and a lineup of vibrant, new restaurants, activities and unparalleled entertainment – all purposefully designed around guests’ preferences.” said Michael Bayley, President and CEO, Royal Caribbean International. 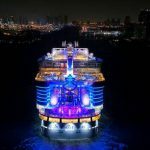 The ultimate family ship, Symphony of the Seas will sail year-round seven-night Eastern and Western Caribbean itineraries from Miami beginning Nov. 17, and will add visits to the cruise line’s highly anticipated private island in The Bahamas, Perfect Day at CocoCay, when it launches in May 2019. The high-energy Boardwalk with activities for all ages, including game-day favourites at Playmaker’s Sports Bar & Arcade, the Sugar Beach specialty candy and ice cream shop, face painting, caricature artists, live music and more. New restaurants including Hooked Seafood, featuring fresh New England-style favourites, and made-to-order Mexican “street fare” at El Loco Fresh. An always-evolving Royal Caribbean app, designed to be a game changer for the guest experience, enables expedited arrival, more personalised experience on board and interactive onboard features. Two FlowRider surf simulators, pumping 128,000 litres of water per minute, perfect for adventure-seekers wanting to hang ten. Twin rock-climbing walls, standing at 12 metres and boasting stunning sea views. A zip line nine decks high, speeding riders 24 metres across an open-air atrium. AquaTheatre, an open-air theatre with jaw-dropping, high-diving acrobatic and aquatic performances in the deepest pool at sea. The 25th ship in Royal Caribbean’s fleet, Symphony of the Seas encompasses 228,081 gross registered tonnes, measures 72 metres tall and spans 362 metres in length. Each week, Symphony will welcome 5,518 guests at double occupancy in 2,759 staterooms, including 28 additional balcony rooms that overlook the ocean or the ship’s signature Boardwalk neighbourhood.